NEW YORK CITY — Left-wing Mayor Bill de Blasio’s office wrote to the Justice Department this week, claiming that the so-called “sanctuary city” was actually in full compliance with federal immigration law — a response to a Trump-ordered crackdown on the havens for illegal immigrants. The letter, sent Wednesday by the office’s legal counsel, lays out the case for how the city is in compliance with federal immigration law, and claims that it is cooperating with immigration officials. The letter comes amid a fresh crackdown on illegal immigration by the Trump administration, and days before a Justice Department deadline. New York City, as well as eight other sanctuary cities, were sent letters by the DOH in April that warned they could lose millions of dollars in funding amid a crackdown on cities that are not co-operating with the federal government on detaining and deporting those in the country illegally. Those letters told the cities that in order to receive their funding, they need to provide documentation and a letter from legal counsel validating that they are in compliance with Federal law 8 U.S.C. § 1373. That section states that a state or local government must not restrict “any government entity or official” from exchanging with federal immigration officials “information regarding the citizenship or immigration status” of an individual. That money would amount to $4.3 million for New York City, but city authorities were hopeful that their letter would be successful in changing the DOJ’s mind. “The letter we submitted today explains that the City’s confidentiality policy exists in harmony with federal law, upholds bedrock principles of local sovereignty and control, and is essential to the performance of day-to-day municipal operations,” Corporation Counsel Zachary W. Carter, who signed the letter, said in a statement. “This longstanding policy protects all residents’ private, confidential, and sensitive information from disclosure to third parties. It is deeply embedded in the City’s regular business practices and has not changed. Our policy builds and maintains civic trust, encourages the public to interact with local government, and protects the health, safety, and general welfare of all New Yorkers,” he said. Officials told the New York Times that the NYPD has received 198 detention requests from ICE in 2017 — none of which were complied with. New York City’s response came as the House passed two laws relating to illegal immigration: Kate’s Law and the No Sanctuary for Criminals Act. The latter cuts off taxpayer grant money to sanctuary cities. 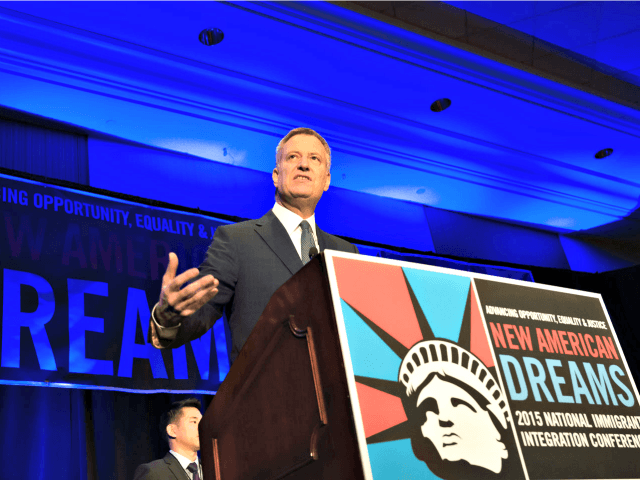 De Blasio has been a forceful advocate for illegal immigrants since becoming mayor — and will frequently refer only to “immigrants,” often failing to make a meaningful distinction between legal and illegal immigrants.